Definition at line 34 of file command-options.hpp. Definition at line 30 of file command-options.cpp. Definition at line 47 of file command-options.hpp. Definition at line 37 of file command-options.cpp. 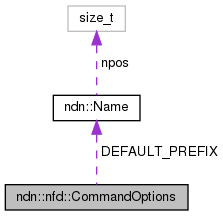 Definition at line 63 of file command-options.hpp. Definition at line 48 of file command-options.cpp. Definition at line 77 of file command-options.hpp. Definition at line 55 of file command-options.cpp. Referenced by nfd::rib::NfdRibReadvertiseDestination::advertise(), ndn::Face::registerPrefix(), ndn::Face::setInterestFilter(), and nfd::rib::NfdRibReadvertiseDestination::withdraw(). Definition at line 91 of file command-options.hpp. Definition at line 95 of file command-options.hpp.